We revisited Inchigeelagh, in West Cork, as we remembered that the church of Saint Finbarr and All Angels had some fine examples of stained glass: Finola is preparing a talk on that subject and our travels are revealing an unexpected abundance of this art in our little bit of Ireland’s furthest reaches. Our last visit to Inchigeela was to inspect the unusual ‘rock art’ that has been built into the wall of the grotto just by the church door. 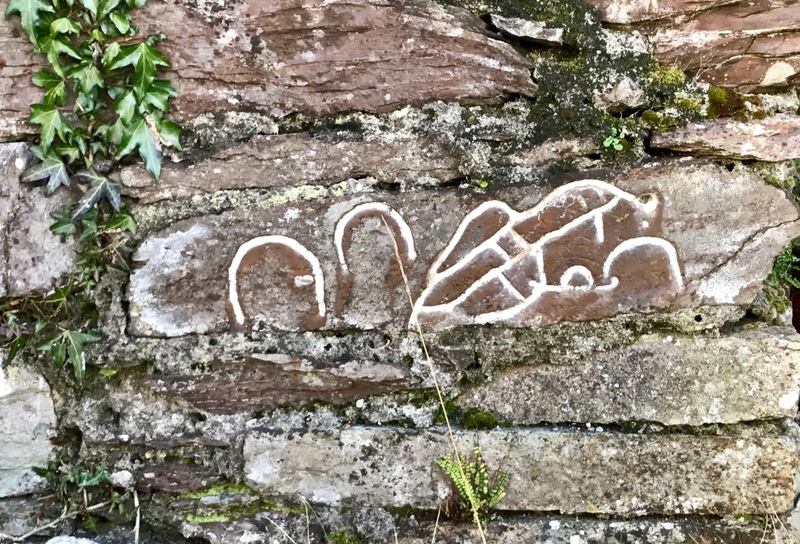 We are none the wiser about the meaning of the ‘rock art’: suggestions include a dove of peace flying over mountains – but I have yet to be convinced. However, it was a good day for looking at the windows: the sun was streaming through the south facing glass panels and creating a kaleidoscope of colour on the surrounding walls. There was plenty to occupy my attention in this church: I had to admire the bear of St Columbanus. This Irish saint spent most of his life on missionary work on the continent and stories about him include taming the bear and yoking it to a plough, and establishing friendships with wolves. I’m not quite sure why, but St Columbanus is the Patron Saint of motorcyclists. 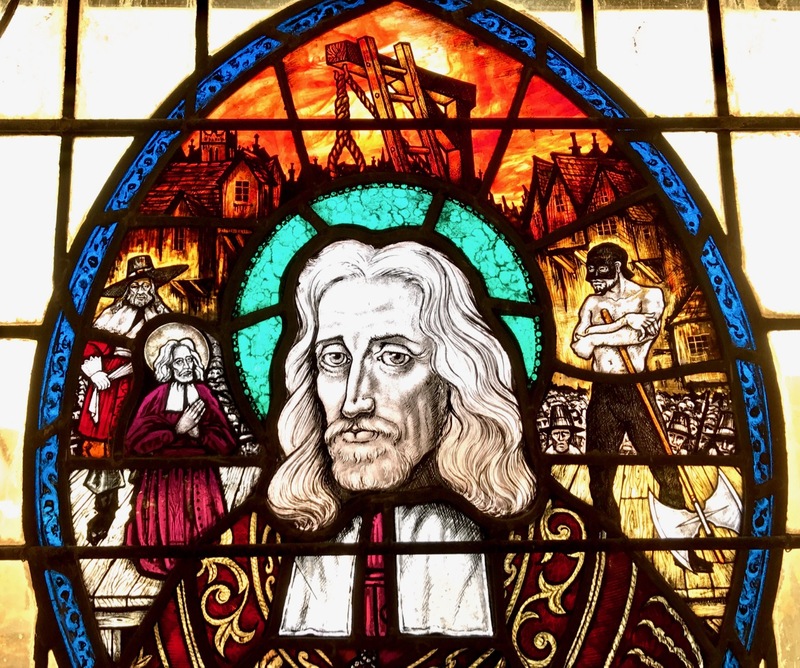 There was one window I had failed to notice amongst the panoply of saints on my previous visit to Inchigeelagh – tucked away at the back of the church: it’s the one at the top of this page – Saint Oliver Plunkett. In some ways it’s the most extraordinary of the windows as it depicts the gruesome death suffered by this Roman Catholic Archbishop of Armagh and Primate of All Ireland at the hands of turncoats and perjurers – and it’s a far cry from rural West Cork. Plunkett was born in 1625 in Loughcrew, County Meath and died at Tyburn, London: hanged, drawn and quartered, in 1681. He was a victim of the Popish Plot, concocted by Titus Oates, an English clergyman who contrived a story that Plunkett was to lead an uprising involving 20,000 French soldiers. Whichever account you read, it seems that no-one believed the story: a trial was held in Dublin but there was no conviction. Plunkett was then sent to Newgate and put on trial again: again the trial collapsed. A third trial, at which Plunkett had no counsel, found him guilty after the jury had retired for fifteen minutes. That it was a monumental miscarriage of justice became evident very quickly: Plunkett’s accusers were arrested – the day after his execution. 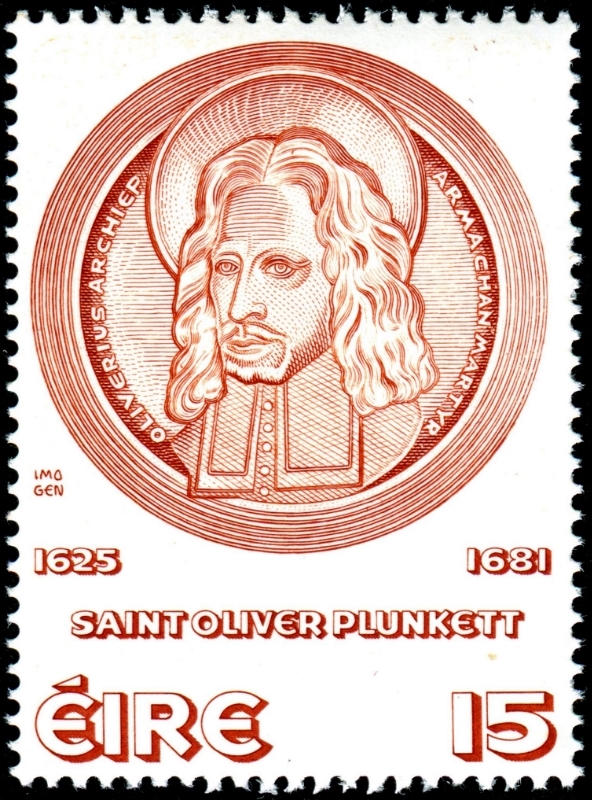 Perhaps the reason why Oliver Plunkett appears in Inchigeelagh is topicality: he was canonised in 1975, thus becoming the first new Irish saint for almost seven hundred years. Above is his shrine in St Peter’s Church, Drogheda, County Louth (his head is on display) and his Canonisation picture. St Oliver is the Patron Saint of Peace and Reconciliation, which in the mid-seventies was timely for Ireland. As ever, it’s timely for the world today. 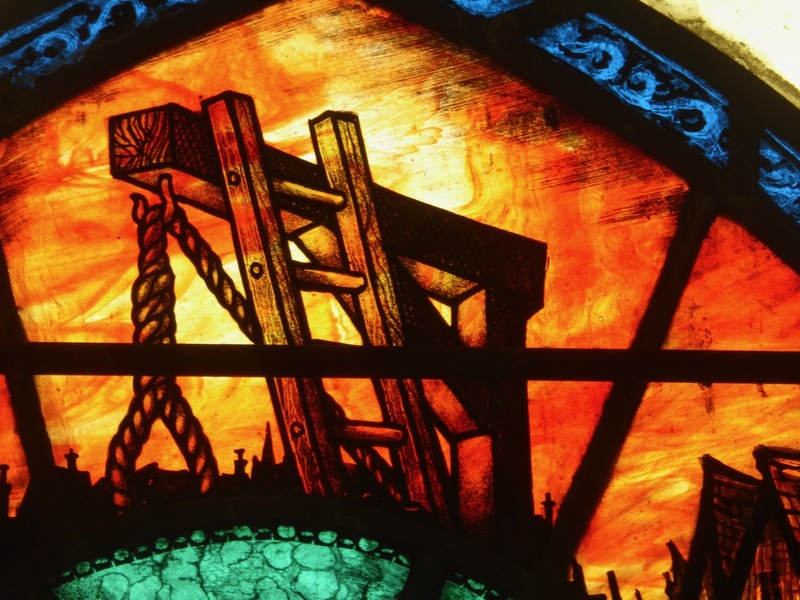 The Oliver Plunkett window was made by Abbey Stained Glass Studios, Dublin in 1992 and the artist was Kevin Kelly. This entry was posted in Inchigeelagh, Irish Art, Irish Heroes, Irish History, Irish Politics, Religion, West Cork, West Cork Blog and tagged Abbey Stained Glass Studios, Church of Saint Finbarr and All Angels, Kevin Kelly, Patron Saint of Motorcyclists, Patron Saint of Peace and Reconciliation, Popish Plot, Rock art, Saint Oliver Plunkett, St Columbanus, St Peter's Church Drogheda, Stained Glass, Titus Oates. Bookmark the permalink. 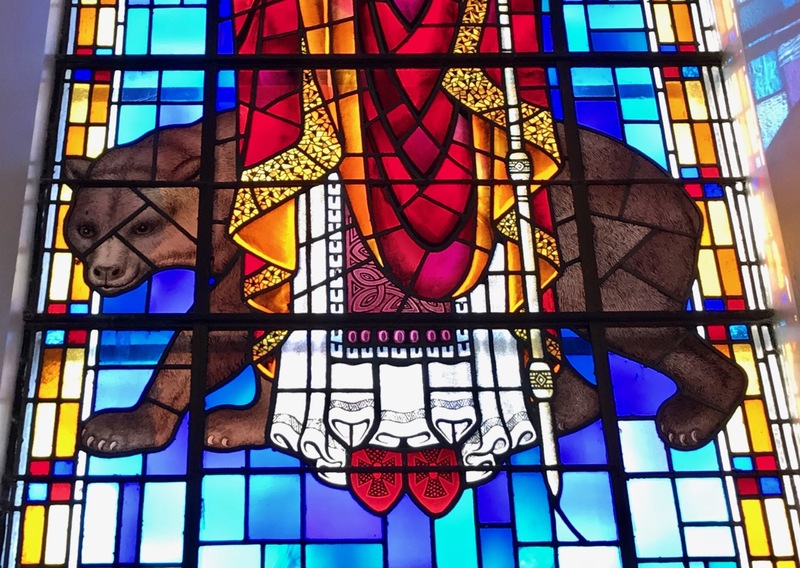 St Columbanus’s bear is rather handsome but the stained glass depicting St Oliver is beautifully and unsparingly crafted – that wise face and the hangman lurking behind. I remember learning about Titus Oates, a bad ‘un. Unbelievable, and it carries on. Thank you, Elizabeth – we have looked that one up. So lovely you have captured the colours and light in the stained glass windows, beautiful! We had really good light on that day – ideal!